If you sleep on your side and have the wrong mattress, it can lead to shoulder pain or hip pain. A good mattress for side sleeping should conform to your body, taking the pressure off your hips and shoulders and aligning your spine so that your muscles can relax. What’s hard about choosing the best mattress for side sleeping is that every mattress feels great in the store, and you won’t feel the aches and pains from misalignment until you sleep on a mattress for a few nights. The body’s trunk (or “core”) has over 30 individual muscles, and excess tension in any of them can cause pain or soreness over time. Thus for side sleepers specifically we recommend buying a mattress online. Don’t get roped in by a two-minute test in a store — that will tell you nothing about ultimate feel and durability in the long run. Online companies typically have a trial period (up to 100 nights in some cases) where you can return the mattress for a full refund if it doesn’t suit your preferences. You should definitely do your research before buying, but at least this trial process takes away the risk of you being stuck with a mattress for years that actually isn’t a great fit. Very high-quality memory foam and has some unique cooling features in their foam. Designed to be a luxury memory foam mattress at an affordable price. Sold online-only by Saatva. This mattress was designed with side sleepers specifically in mind. The very top layer is a new concept called Air Foam. These mattresses are not necessarily #1 in my overall mattress reviews, but they do rate the highest when considering side sleepers. Note these are all high-quality mattresses that I consider very durable, especially the Purple 4 mattress. Why These 5 Mattresses for Side Sleepers? Amerisleep has a line of memory foam mattresses that are built with specific firmness levels and sleeper types in mind. They definitely do not believe that there is one best mattress for everyone. The AS4 is built for side sleepers, and we think it is an excellent choice for people who want a high-quality mattress that relieves pressure very well. 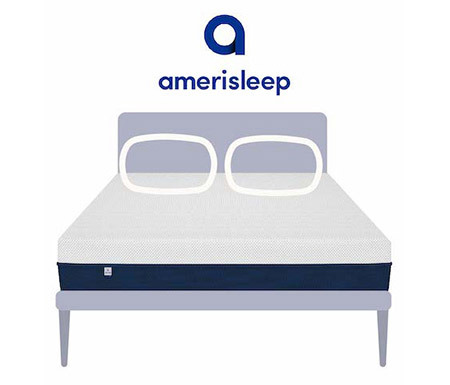 Amerisleep also probably does the best job of any memory foam mattress company at sleeping cool. Simply put, you will not sleep hot on an Amerisleep mattress. Amerisleep mattresses are built to last, so they are also great long-term investments. This makes their mattresses really great values. The Amerisleep AS4 stands out because it is so comfortable and eliminates any pressure points you might otherwise have. It uses Celliant in its cover. Celliant can potentially give you certain health benefits and provide for a cooler, more restful sleep. I would encourage you to do your own research on this topic, but the claims they make seem to be valid. They use partially bio-based foams. This mattresses a little more green, especially when compared to other memory foam mattresses. The pressure relief is very good. This mattress performed exceptionally well on our pressure map testing. You get great pressure relief without the feeling of getting stuck with this mattress. You get all the benefits of memory foam without the drawbacks here. Learn more in our Amerisleep AS4 review. The first thing you notice about the Layla mattress is just how comfortable it is. The memory foam gets to work immediately and relieves any pressure points that you might otherwise have. The Layla is a really good value overall. It truly feels like a mattress that would cost 2-3x more if you found it in a retail store. It is also an excellent option for side sleepers. The soft side features copper-infused memory foam, which really just melts any pressure away. You shouldn’t feel any pressure points on this mattress. The Layla also has that classic memory foam feel. You should slowly sink into the mattress and feel that soft, quicksand-like feel. If you like sinking into your mattress and sleep on your side, Layla should be on your list of mattresses to consider. Layla is one of the most comfortable mattresses I have ever slept on. The memory foam on the soft side of the mattress simply melts any pressure away. 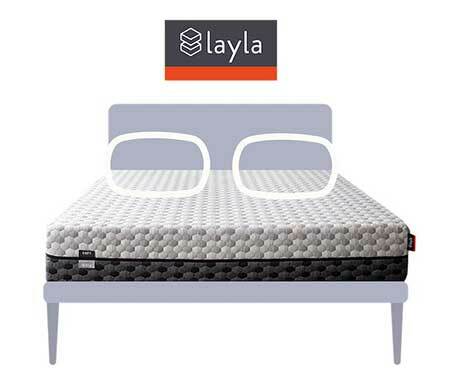 With the Layla, there are actually two firmness levels in one mattress. I think the soft side is the most appropriate for side sleepers, but this is a cool innovation either way. Simply put, Layla does one of the best jobs of a memory foam mattress in sleeping cool. There is Thermogel infused into the cover. There is copper-infused memory foam, which works to draw heat away. There are also air channels in the mattress to allow for more airflow. The copper-infused memory foam could also give you some health benefits. The copper is antimicrobial and could also promote blood circulation. I would encourage you to investigate this on your own, but I do think many of the claims made here have merit. Loom and Leaf is designed to be a luxury memory foam mattress at an affordable price. 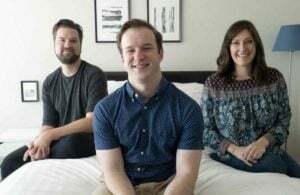 The mattresses is sold only online, so it can compete with some of the top memory foam brands in terms of specs (think Tempur-pedic) at a fraction of the price. They’re not marking up the product by a huge margin just to fund retail locations. The company uses very high-quality memory foam that offers side sleepers great support. 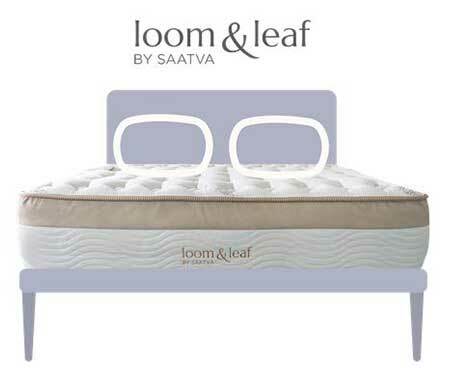 Loom & Leaf is made by an online innerspring mattress company (Saatva) that has been in the game a long time. 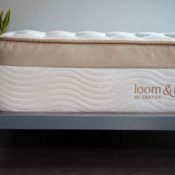 They wanted to take on the high-end of the memory foam market, and Loom & Leaf is doing just that. The mattress comes in three firmness settings: soft, medium, and firm. For side sleepers, we definitely recommend either the soft or the medium. The great thing about memory foam (especially quality memory foam like you get with Loom & Leaf) is that it has the best tradeoff between comfort and support while providing great orthopedic benefits. People often tell us their backs feel better after sleeping on these mattresses. Why Makes Loom & Leaf Stand Out? This mattress is best for people who sleep on their side but want a little bit of initial pushback/firmness when they first lie down. This mattress uses high-density foams, meaning it will last longer than many other mattresses and it will contour better to the exact curves of your body. The company has addressed the issue of sleeping hot very well with this mattress. This mattress is a good fit for people of any size. This mattress has a memory foam feel that resembles mattresses much more expensive at retail stores. The Purple 4 is excellent for heavier side sleepers. You get four inches of the pressure-relieving gel material that the company calls hyper-elastic polymer. The material feels great overall, and with the Purple 4 you basically get a weightless feeling that I think most heavy people will really like. I like Purple mattresses a lot overall and would say there is a good reason why the company is so popular. 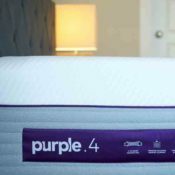 What Makes The Purple 4 Mattress Stand Out? This mattress is especially good for heavier side sleepers because there is no risk of “bottoming out” like there is with some other mattresses. This mattress is completely temperature neutral, meaning there is no risk of sleeping hot. This mattress is probably the most durable mattress I have reviewed to date. The pressure relief is really excellent on this mattress for people of any size. 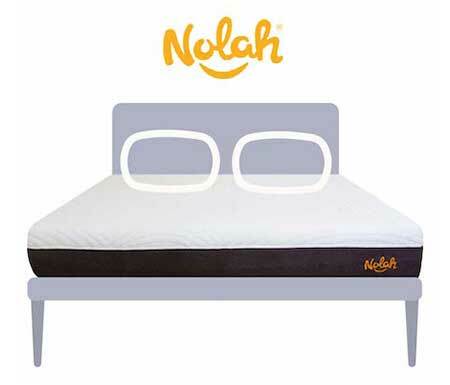 Nolah is a unique mattress because it does not use latex or memory foam in its comfort layer. The very top layer is a new concept called Air Foam. This mattress was designed with side sleepers specifically in mind. Testing shows that this mattress relieves pressure than memory foam does. From my personal experience, the pressure relief really stood out to me as the best quality of the mattress. The mattress is also temperature neutral, so the pressure relief doesn’t come at the cost of sleeping hot. If you want to take a shot on a cool, new concept, Nolah is certainly worth taking a look at. What Makes Nolah Stand Out? The mattress has a propietary foam that is supposed to relieve pressure even better than memory foam. You get great pressure relief with this mattress, without the feeling of getting stuck. You will not sleep hot with this mattress. The mattress is longer-lasting than many of its competitors, making it a really great value. If you weigh 225 lbs. or more, then you will have special needs when it comes to getting a mattress. If you sleep on your side, because you are heavy you have a greater risk of “bottoming out.” Bottoming out means that your weight presses through the top comfort layer(s) and then engages with the support layer(s). 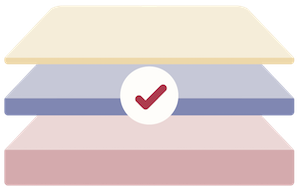 This means that even if the top of a mattress is soft, if you bottom out you might think the mattress is firmer (because you hit the firmer support layers beneath the comfort layers). To minimize the risk of you bottoming out, you should try to find a mattress that has a thicker comfort layer (something around 4-5 inches thick). If you are heavier, you have greater support needs as well. You typically will want either high-density foams in the support layer or pocketed coils (even more ideal). Having said this, I think the Purple 4 is an excellent choice for heavier side sleepers. You get 4 inches of the hyper-elastic polymer gel material. This means you won’t bottom out. I had Marten from my team (who is 230 lbs.) sleep on the mattress and he didn’t feel any pressure on his shoulders and hips at all. The mattress has pocketed coils in the support system. This means it is going to be about as supportive and durable as any other mattress out there. It relieves pressure extremely well, has a thick comfort layer, and is highly supportive. That makes it an excellent match for heavier side sleepers. If you sleep hot and sleep on your side, you might find that it is a little bit harder to get a mattress that is the right fit for you. Memory foam is a great sleeping surface for side sleepers, but one of the biggest complaints people have about the material is that it traps heat. So while you get one of the things you are looking for, you also get something you are looking to avoid. You’ll have to do some extra research to find a mattress that fits both criteria. Luckily, I believe that the Nolah mattress is a great fit for both side sleepers and those who sleep hot. If you’ve read the above passages, you’ll know why I think it is so great for side sleepers. It relieves pressure very well and is definitely softer than average. What’s also nice is that it isn’t made with the same chemicals that memory foam is made out of the trap heat. The result is that the mattress provides a temperature neutral sleeping surface. That means you get great pressure relief without sleeping hot. That’s a great combination in my opinion and is one of the reason why Nolah is so popular. If you have neck pain and you sleep on your side, I would argue that the most likely reason you have the pain is because of your pillow, rather than your mattress. If your pillow isn’t supportive enough, then your neck will crane downward in an unnatural position. That can easily cause neck pain issues. Similarly, if your pillow is too thick, then your neck might crane upwards, which can also cause pain issues. That was actually the issue for me 10 years ago when I had neck pain. I used two thicker pillows and develop neck pain. As soon as I corrected my pillow situation, my neck started feeling a lot better. So instead of recommending a mattress to alleviate your neck pain, I would rather encourage you to check out our article on the best pillows for side sleepers. Any of the recommendations on that page should help alleviate any sort of neck pain issues that you may have. Again, I don’t think your mattress is the cause of your neck pain, nor do I think getting a certain mattress will alleviate your pain. I would take a look at your pillows. If you have back pain, I would first encourage you to see a doctor and get his/her opinion. These paragraphs do not constitute medical advice. I can only give my general opinion on the relationship between back pain and mattresses. Typically, if you want to avoid back pain, you will want something that is more supportive and potentially a little firmer. This is definitely the case for back/stomach sleepers. It gets a little tricky when it comes to side sleeping, however. That is because what I just said contradicts what I’ve been saying in this entire article about how side sleepers want something that is a little softer and more pressure-relieving, with a thicker comfort layer. Essentially, you want a balance of pressure and relief and support. You don’t want the comfort layer to be too soft or too thin. You should seek a mattress that relieves pressure enough for you to be comfortable but is also very supportive at the same time. There aren’t too many mattresses out there, but I would check out the Purple 3. I think that mattress is very supportive, yet the gel material is great at relieving pressure at the same time. If you have hip pain, the reason might be because of your mattress. However, I would still first consult a doctor before anything else. These paragraphs do not constitute medical advice. I am just giving an overview of my thoughts on this subject. If you have hip pain because of your mattress, it is either because it is too firm or you are “bottoming out.” Bottoming out means that your weight presses through the top comfort layer(s) and hits the firmer support layer(s) beneath. If you are bottoming out, then you need to find a mattress with a thicker comfort layer. If the top layer of a mattress is super soft, you can still feel a lot of firmness if you bottom out. That’s why you need a thicker comfort layer. I think the Amerisleep AS4 or the Purple 4 are good matches for hip pain. They relieve pressure well and have a thicker comfort layer. They are softer than average and they don’t really run the risk of bottoming out (unless you are extremely heavy). I would give those mattresses a look if you are worried about hip pain. It’s no coincidence that there are 3 memory foam mattresses out of the 5 listed in this article. Memory foam does an above-average job at relieving pressure compared to other types of material. So which one of the 3 should you get? If you are looking for the truest memory foam feel where you slowly sink into your mattress and pressure really melts away, then I would take a look at the Layla mattress. 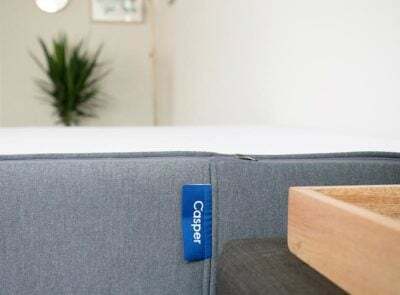 The soft side of the mattress (it’s flippable) is definitely softer than average and does an excellent job of eliminating any pressure while on your side. A lot of memory foam owners complain about “sleeping hot.” That is because memory foam can trap heat more than other mattress materials. If you want a memory foam mattress but are worried about sleeping hot, then I would look at the Amerisleep AS4. There are about 5 different ways why you will sleep cool at night. It probably does the best job of any memory foam mattress in terms of addressing the issue of sleeping hot. If you want something with a little bit of firmness but is still a good choice for side sleepers, then I would take a look at the Loom & Leaf mattress. It has a unique feel where there is some initial firmness, but then the high-density memory foam layers start to kick in and the pressure goes away. 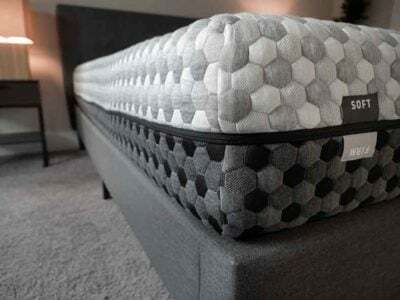 It’s pretty cool in my opinion, and that’s why I think it’s a good option for side sleepers who want a little bit of push back from their mattress. Latex mattresses have good bounce to them. They are durable and they also conform well to the curves of your body. The foam is open-celled, meaning they are more breathable than many other types of mattresses. While all of these attributes are good, from my personal experience they don’t relieve pressure as well as memory foam does. There’s a reason why there are not any latex mattresses on my main list in this article. Having said that, I do feel that the Zenhaven mattress is a great latex mattress pick for side sleepers. 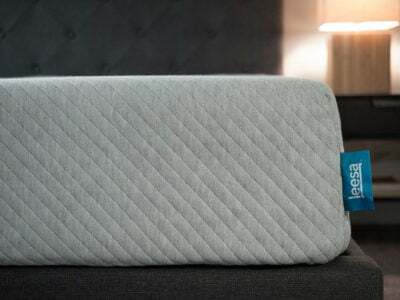 It is a flippable mattress with two firmness levels in one mattress. If you sleep on your side, then you should definitely choose the soft side of this mattress. I feel that it is a good value and will be one of the more durable mattresses you are going to find. The pressure relief is solid, especially for a latex mattress. Overall, it’s just a good mattress. Innerspring mattresses are very popular and are what a lot of people are most used to. The spring support system can make them good choices for back and stomach sleepers, but the materials on top of the springs are what can make them good for side sleepers too. I like the Winkbeds mattress a great innerspring option for side sleeping. The coil on coil system makes the mattress great for contouring to the curves of your body. The pillow top is nice and soft and has a great feel to it that I think a lot of people will really like on their side. While this mattress didn’t quite make my overall list, it is still a great choice if you know you would like to get an innerspring mattress. From my experience, budget mattresses aren’t as good for side sleeping because they don’t have many premium materials in them. Usually they are really firm and don’t have much of a comfort layer. So it can be hard to find a good mattress under $700 if you sleep on your side. Having said that, I do think the Casper Essential is a good budget pick for side sleepers. It has a lot of the same design concepts as the original Casper does but at a much more affordable price. You still get 3 inches of premium foams, including a memory foam second layer. The mattress overall is softer than average and it performed well when I did a pressure map test. Overall, it is a good mattress for side sleepers at an affordable price, so I think you should consider it if you fit in this category. If you sleep on your side, you are going to be naturally putting a lot of pressure on your hips, shoulders, and neck, which can cause tension throughout the spine. To sleep comfortably, you want a mattress that is soft enough to relieve those pressure points. Foam mattresses tend to be great at relieving pressure points and can be ideal for this aspect of sleeping on your side. If a mattress is too firm, it will cut off a lot of the blood circulation in your body, and it will potentially cause major aches and pains because it doesn’t contour to the widest points in the hips and shoulders. It could lead to waking up in the middle of the night a lot, as well as a significant amount of tossing and turning as your body struggles to find a supportive position. A mattress that is too firm is something you want to avoid if you spend most of your time sleeping on your side. As I mention in my Tempur-Contour Supreme review, not all mattresses are suited for side sleepers. It is critical for your health that you find a mattress that contours well to your body and supports the natural alignment of your spine. If you sleep on your side and the mattress is too firm, your neck won’t be properly supported and your spine will be thrown off its natural alignment. This could lead to back and neck pain fairly easily, which may compound over time. That’s yet another reason why purchasing online from a company with a 100 night free trial can be so beneficial. You truly get to test to see what works for you! If the mattress is too soft, you could sink in too much and your spine will be too curved. This could similarly lead to pain across your body. A mattress that is too soft is not ideal either. Other Mattresses For Side Sleepers? There is no one best mattress brand or type for sleeping on your side. A spring mattress with a pillow top can be a fine solution. Something unique like the Purple mattress can be great too, especially with their new models that have recently come out. A higher density memory foam mattress can be great, too, as it contours very well to your body and still relieves the pressure points on your hips and shoulders. Latex mattresses also can be good options. There is more than one way to skin a cat in this scenario. I recommend starting with the brands I recommended, see what you like or don’t like, then use that as a starting point for making your final decision. Hey Joe; I recently bought 2 beds to try out; I bought the twin XL Loom and leaf (medium standard), and a twin XL Layla mattress (using the soft side); the Loom and leaf is a quality built bed, but I am 215 pounds and the classic memory foam feel is not for me; I also owned the standard purple (tried 2 kings) and I sent both of those back as well; I woke up on both of those mattresses (purple and Loom and leaf) with numbness in my shoulders and arms, but the Layla allows a full night’s rest; I sleep on all sides, but primarily my side; what mattress will offer a little more softness than the Layla without the classic memory foam feel for a side sleeper that weigh’s 215 pounds? I was thinking of the Winkbed (soft), or maybe, the Brooklyn signature (soft); I have watched alot, ALOT, of your video’s, and have read most of your review’s; any help would be great! Thanks! Maybe consider the Nolah 12″ mattress then. I’m 6’0″ 225lbs., side sleeper. My wife is 5’1″ 145lbs, back/stomach sleeper. Currently sleeping on a 15y.o latex mattress. I’m thinking about getting 2 Twin XL’s (with adjustable bases), instead of a King due to our size/sleep differences. Is it a bad idea to get two different brands (trying to get similar mattress thickness) vs. one brand in different firmness? What would you recommend? You can also include brand/models. Thanks for your help – love your site. That’s not a bad idea. You could also check out Helix, where you can customize two sides of the mattress. You can check out Luxi as well, which allows you to customize multiple sides once you’ve received the mattress. Wow! Finally a mattress actually made for how I sleep! I would love to try this mattress. It seems like a absolutely great mattress to have. Love the perspective of Martin, getting a bigger guy in the mix. I really love the addition of Marten’s perspective. Layla is a great choice, but Amerisleep’s memory foam has the closest quality to Tempur-pedic’s I’ve tried. The AS4 seems like it would be an AMAZING fit for my mom, but personally, I liked the AS3 better. We’re both side sleepers, but she likes a softer feel than I do. She’s been trying to the Loom & Leaf, but it’s super firm to her, so it’s causing her a lot of pain. My mom is 5’1″ and 115lbs, so I don’t think she’s able to feel past the initial firmness. The Purple4 seems crazy nice, but if I wanted to pay $2,800 for a mattress, I would get a Tempur-pedic; the new 2018 models they released look awesome. Mattress Clarity, have you tried the 12″ flippable Nolah mattress yet? I wonder if that would be a better fit for Marten and people like us. We are reviewing the Nolah 12″ right now. I think it is definitely a better match for heavier sleepers for sure. So many choices in mattresses now — how does the Serta I-comfort line compare to those reviewed ? I, like many older folks I know, remain reluctant to buy a mattress I can never try out until it enters our bedroom–even with long trial periods and return guarantees, it seems somewhat akin to entering a “mail-order” marriage. Joe, how does a Serta Perfect sleeper compare for a side sleeper? It depends on which model you get. If you get one of the softer models, then yes it would be a good match for a side sleeper. This is a wonderful site. The detail you go into in analysing each mattress is truly impressive. I’m a side-sleeper and this saves me a lot of leg work! I am a side sleeper coming from a motionless waterbed and rather heavy (280#). I sleep on my left side due to shoulder, hip and knee issues on the right and a lower back injury. A sleep mapper at a local store suggested the Tempur-Pedic hybrid’ Sealy Hybrid (Kelburn), and Sterns & Foster Oak Terrace (cushion firm or luxury plush). Any suggestions as at present I am tempted to go with a Gold Bond Florence Plush at $900 (cal king) since it felt about as comfortable in the show room and was a lot cheaper. I can only comment on the online ones we’ve reviewed. If you did a pressure map test and liked something in the store, then I say give it a shot. Of the one you have reviewed which would you say is best if coming from waterbed? Temperpedic hybrid was good – alternative to that? I don’t think there’s any specific one that would be especially good for someone coming for a waterbed. Awesome website. From other r views of yours I thought Live and Sleep was the mattress for my wife and I (good value). But we are both side sleepers! Should we ditch Love and Slrro for one of these ones?? Thanks! Are you happy with the current mattress? Anything wrong with it in your opinion? I noticed that Casper has a new mattress called “The Wave”. Are you planning on doing a review on the Casper Wave? At some point in the not-so-distant future, yes. I am 5’10” 200 lbs. Side sleeper. Had a Zinus then just received a Nectar a month ago. My arms end up falling asleep every 20 minutes and I am constantly tossing and turning. I am thinking the Nectar is too firm. Looking at Nola and Layla. Thoughts? Thank you. Try the Nolah or Amerisleep AS4. I’m driving myself crazy researching these things. Needless to say I stumbled upon your reviews and certainly glad I did. We got our 19 year old daughter a zinus 12″ green tea infused mattress over the summer. She loves it and would live on it if I didn’t make her get up every day. My wife and I are in the market for a new one as ours is a completely delapitated and worn out spring. I came down with H3N2 over new years so my wife had to sleep in our daughters bed. Now she swears by the mattress as well. We are all side sleepers. My wife and I 125lbs, 250lbs. I suffer from severe lower back pain that radiates to my hip. As I mentioned, our current mattress is ancient, so my arms fall asleep and its killing our bodies in general. My wife auffers from a neck injury as well. We want a king size, she wants the zinus we got for our daughter. The product does appear to have a ton of good reviews and its super inexpensive . However, there’s no mention of sleeping positions, weight etc. And after researching these things I am slightly nervous. I was looking at the purple mattress, then I found some mixed reviews and got nervous about that one. So, I am at a loss man. Do I go with the one we got our kid and my wife says is comfy. Or do we try something else? Would you suggest 12″ or thicker. Or should it be thinner? I’m starting to go nutso here lol. Any info you have or can offer would be much appreciated. It seems like all memory foam is the same, just a dif manufacturer and various thicknesses. I also don’t want to end up with something that will smell for the next year off gassing. Looking forward to your response. Thanks so much!! The Zinus is a good value, but it will have a shorter lifespan. If you are both side sleepers, the Purple is a great option. The pressure relief is really good. So…we could use some help. We’re primarily side sleepers. We’ve tried the Bear (had some issues with arms falling asleep, and a little hip discomfort after about 6-7 hours), so we tried a Nolah thinking we needed to go a little softer, but it created lower back pain and some random other aches and pains — probably too soft. We’re looking for another side-sleeper memory foam mattress that sleeps cool that might be somewhere in firmness between the Bear and the Nolah. Do you have any recommendations? Thanks in advance! Loom and Leaf should be in between those two firmness levels. tempur-pedic mattress. Wake up sore everyday. There are so many to choose from. 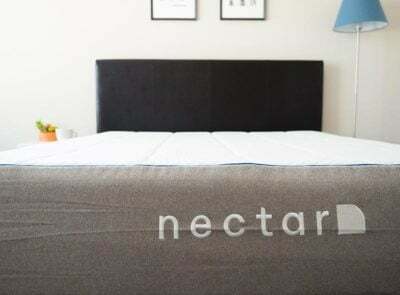 What do you know about Nectar mattress? Can you give me a recommendation? I am a side sleeper. You can see our Nectar review here, https://www.mattressclarity.com/reviews/nectar/. It’s a solid value. The recommendations listed on this page should be good choices for you. Hi. I am looking to replace a fairly new Loom & Leaf that my cat urinated on. (Figures the mattress pad wasn’t on the bed that week.) Anyhow, the mattress was ok, but I still experienced occasional shoulder discomfort and lower back pain. I sleep entirely on my side, weigh 150 lbs and am a 50 yr old female. The Nolah sounds like it might work for relieving pressure points, but I’m concerned about the lower spine support with a softer mattress. Do you think the Nolah will offer good support along with the softer comfort or is there another brand that you would recommend? Thanks! I do think the Nolah would be a good fit for you. 5’5″ side sleeping 50 yr old female here. I tried the Loom & Leaf which was ok in the beginning but started causing pain in my shoulders and scapula after about 6 months and also slept too hot. I tried the Nolah 12″ and found it a hair too soft and didn’t particularly like sinking so far into the mattress. Tried the Purple 3 and found it to be perfect for my lower back and hips but it caused significant pain in my shoulder and spasms in the muscles around my scapula. Also, I can’t seem to find the right pillow to use with the purple and have continual stiff neck discomfort, which did not happen with the Nolah. I do love the bounce of the Purple and sleeping on the top of the bed was very helpful in keeping cool at night. So, back at the drawing board and am considering the soft version of the Nest Alexander Signature or the Brooklyn Aurora. Which one do you think would work best, given my experiences with the other beds? Is there anything else you think would work better than these two? Really appreciate your help because I’m overwhelmed with the choices out there these days! Thanks Joe….In the mid 90s when we bought this mattress it cost $5,000 and has been relatively comfortable given its age. What has happened now is that I am older (71) and have had a few surgeries, so its usefulness has outlasted my body. I am considering the Loom & Leaf, but on the chance I continue to toss and turn at night. Which one of the soft or medium mattresses be better should I continue this habit. Would my current box spring be suitable to use with the L&L mattress? Box spring should be fine. L&L and Nolah are good for those who want good pressure relief so they don’t toss and turn. Hi Joe: I had asked a question earlier this afternoon and have not received a reply. Did you get my message? I have had three replacement surgeries – shoulder, and two knees. I also sleep with oxygen every night and it is difficult to sleep because I constantly toss and turn…no telling if it is just me or the mattress. Consequently it is hard for me to get into a deep sleep because I awake when this happen and when I wake I feel very achy in my shoulders, back and hips. Our current mattress is a coil spring pillow top that is 25+ years old so now considering if a foam mattress makes sense or should I stick with a coil spring. So what do you think? I think you would do fine with the mattresses listed here. It sounds like it would be a step up in quality from your current mattress. I wouldn’t worry about coil versus foam. You just need good pressure relief and that’s exactly what the mattresses listed here provide. I’m a side sleeper, 5’4″ female 150 lbs, 60’s. I have issue with pressure points in my shoulders and hips. I am currently in the process of returning my DreamFoam mattress made by Brooklyn Bedding. I ordered the firmer version of the mattress. While this mattress was okay for the pressure points, I was going to buy a 2 inch talalay topper if I liked the mattress. The problem I had with the mattress and the reason I’m returning it, is that I started to have back aches after about 2-3 months. I recently noticed a sag where my hips are on the mattress and have used a pole to verify the difference, even waiting until it’s time for bed to check it just in case it was taking a minute to go back to it’s shape. With that said, I am considering Purple, Casper, EightSleep, SleepOnLatex, Plush Beds (Ecobliss), IKEA (Morgongava) and even creating my own 3 layer via FoamSource. I do not like memory foam. I prefer the mattress to bounce back. Previously I had a firm coil mattress that I put a 3.5 Geo Matt topper to relieve pressure points. I decided to get a new mattress because I had to replace the topper every 1-2 years at $100 each time. Thanks for having this site. It’s so important with all the online mattresses, although laying on a mattress in a store for 5 minutes sure doesn’t tell you anything. Although I do plan on going by West Elm to take a look at Casper. I think Purple really intrigues me although I worry about durability. The Purple gel layer will not sag. It is extremely durable. That could be a great fit for you. Take a look at Purple. Haven’t done a review yet! We purchased a Tuft and Needle about 6 months ago. I get severe shoulder pain sleeping. I am overweight and a side sleeper. Should try adding a mattress topper to it or start over? Thanks! It’s not a bad idea and it’s low risk to just try a topper. It can work out just fine a lot of the times. Thanks for your help! Your website and the comments here are very informative. How does the Love & Sleep medium mattress compare with these options? My husband and I are both mostly side sleepers and sometimes back sleepers, we both have shoulder and upper back problems, and we’re both light: 118 and 135 pounds. From my reading, it sounds like our being light and being side sleepers indicate that we need a medium mattress. Love & Sleep sounds like the best one for us so far, but I’m still reading to see if I missed a more suitable option. Love & Sleep is a great mattress. The medium should be okay for you but possibly could still be slightly too firm. My wife and I are both side sleepers.Your articles are very helpful. My wife tends to get hot at night and we attribute this to the older tempurpedic mattress that we have. We see most of the ones you recommend have at least some memory foam. Which ones do you feel would best meet our needs? Take a look at Nolah. It is temperature neutral. It should work on just about any surface. Reach out to them directly to make sure of your exact situation though. I have a herniated c6, am a side sleeper, and frequently wake up with shoulder and shoulder blade pain. Unfortunately, I’m also extremely sensitive to smell and have noticed that most memory foam mattresses and toppers have a strong smell/”off gassing.” Can u recommend a mattress that would meet my needs? Thank you. Take a look at Purple or Nolah. What do you think of the sleep number beds (for side sleeping )? The cost is significantly higher than your recommended companies- are they worth it? My husband and I are middle aged , side sleepers, with a bit of snoring and restlessness (his- that wakens me). We almost brought a sleep number home…. I think they can be good options. My biggest concern is the price, so that’s why I list these options out on this page instead. hey Joe I just pulled the switch on a Nolah mattress for side sleepers. I have stenosis in the lumbar region and bought this based on your review. Good decision? Yeah, give it a shot! I am about 125 lbs and my husband about 200. We are both side sleepers with occasional back sleeping. I wake up with severe shoulder pain. We are currently sleeping on a hybrid. I also sleep extremely warm. What would you suggest. We have been looking at the cariloha bamboo mattress for the cooling qualities, but are open to anything that will keep us cooler an alleviatey shoulder pain. I would say Nolah and Purple are two you should look at. They are great for side sleepers and are temperature neutral. Thank you for the great information. My husband and I are in the middle of trying to find a mattress. We bought a Sealy hybrid Silver after sleeping on for the required 30 days we both experienced stiff necks in the morning and tossing and turing all night and thought it was too hot even with a “Dri-Tec cooling mattress protector.” We a now on a Sealy Crown Prince Ultra Plush and I am waking up several times a night and having lower back pain and shoulder pain in the morning. I’m not sure why so many places are requiring you to sleep on a mattress for 30 days. I’ve traveled quit a bit and sleep on many beds, some were just miserable, 30 days wouldn’t have changed that. I am a side sleeper I weigh 120 I also had a spinal fusion lower back, as well as Sjögren’s syndrome which can cause all over pain. My husband sleeps primarily on his back but also on both sides he weighs 220. We have been purchasing twin extra long mattress because he is such a restless sleeper. Previously we were sleeping in separate rooms. I had a Serta Bellemont (cheaper bed from Big Lots) with a Serta 3″ gel memory foam topper slept great and woke without pain. We are so frustrated and i’m pretty sure the local mattress store wants nothing to do with us. Would love to here your recommendation, thank you. Maybe check out Helix or Tuck? They can split the mattress in two and customize the two sides to your different preferences. You sound like you’d be a good candidate for a customized mattress. I have been trying to find the right bed to suit me and my husbands needs. I am 120 pounds and my husband is 220. We have tried an iComfort which caused me pain and numbing. We then tried the loom of leaf which I thought was decent. My husband did not like the give in the bed on the edges and the pillow top started to buckle after 2 mo. However, I did experience occasional numbing in the arms sporadically. It was not every night. I wanted a bed to eliminate the occasional numbing so I tried the sleep number i8. The i8 caused my husband and I both back pain, shoulder and neck pain. I also experience numbing in the legs and arms. No matter what number I tried, I could not find any comfort. I am trying to nail down the right bed to alleviate my pressure points, provide the best support and comfort for both of us. We are both side sleepers and my husband sometimes sleeps on his back so I was looking at the best beds to address these concerns. Additionally, due to the difference in weight, I do not want to feel like I am rolling to him. From the options here, I am considering Amerisleep or Nolah. I am hoping to land the perfect bed with our next purchase. What do you recommend for me to try out with my next purchase? FYI: I use the snuggle pedic pillow memory foam. The Nolah does relieve pressure very well. I think it’s a great choice. You can also look at Helix or Tuck, as they can customize 2 sides of the bed to you and your husband’s individual preferences. I am a side sleeper, and I have been looking at the Brooklyn Bedding medium mattress. Have you reviewed this one? Thanks! Not sure how the Ghostbed is on the list for side sleepers? My husband and I are both side sleepers and we could not make it more than 4 nights on the ghost bed, our limbs were falling asleep and we woke up exhausted and in pain each morning. The mattress is far too firm for side sleepers, it felt like sleeping on the floor. They also had terrible customer service, it took us over 2 months to be able to receive a refund for the mattress. I have slept on very soft mattresses for my entire life. I’ve never even owned a coil mattress. My current bed is a talalay latex foam mattress. They gave me their softest foam, but it’s way too hard for me. So on top of the mattress, I have a softer 2″ talalay mattress topper, a 3″ memory foam topper, with a 2″ gel memory foam topper at the very top. That finally made it soft enough for me. I never wake up with back problems on an extremely soft mattress. All of these new foam mattresses have my attention, but they all look quite firm to me. Which would be the very softest mattress out there? The Tempur-Pedic Cloud Luxe is extremely soft. That’s an option, although it’s pretty expensive. You can also look at company’s with firmness options. Novosbed has a soft option that I think would be soft enough for you. I have to disagree on the Amerisleep beds. I’m getting a refund from them as I write this comment. Thier mattresses are soft enough for side sleepers. I’m not speaking bad will against them. Their product is high quality and customer divide is awesome. I’m just disappointed that the mattress that we purchased was not soft enough for us as my husband and I are side sleepers. Neither of us slept well and we woke up several times a night. Both of us would wake up complaining with an arm asleep several times a week. We hated that the mattress didn’t work out for us. Hi Mike – Amerisleep is a good option, definitely one of my favorites. You might also consider a hybrid as well – these sometimes work out better for heavier sleepers wanting better support. Check out Sapira as an example. trying to decide between L&L memory foam and the saatva coil spring ! definitely getting linear adjustable frame. I sleep on my side with pillow between my knees. please help! I like L&L better for side sleepers. I’m a side sleeper and have tried the GhostBed for 2 months. My back pain is much improved, but I’ve developed pretty serious shoulder and neck pain. I’ve tried multiple pillows but it’s persisted and worsened. Any thoughts on next steps? I like that my low back pain is gone, but this neck pain…I can’t take it. Thanks! Hmm, I’m not a doctor, so I hesitate to give out firm advice for pain issues. In my experience neck pain is usually a pillow issue, so I would look there first rather than focusing on the mattress. Cause the implant is always cool, it never sinks in like the rest of me. This gets to be very painful very quickly. Thoughts? Hi Carol – I would look at a hybrid, something like Sapira, WinkBeds, or Saatva. Noticed Casper didn’t make it on this list. How would you rank it for side sleepers that weight around 140-160 lbs? Hi Dan – Casper is also a very good option. Hi. Thank you for the great website! I recently bought a Leesa but find it too firm. It aligns my spine well but gives me hip pain and I don’t like feeling like I’m sleeping on the surface. . I’m a side sleeper, about 175 lbs, my husband is 220 lbs and could sleep in a gravel pit. I’d like something a notch or two softer and cozier, without feeling stuck in the mattress or sacrificing spine alignment. Any suggestions? Check out the Nolah mattress. Joe, I have a strict budget constraint and looking at Tuft&Needle. I am a side sleeper. Is is fine? Hi Satish – T&N offers value at that budget, but generally I think it’s a bit firm for the average side sleeper. Awesome info. Do any of these company’s ship to Canada? I checked into 2 of them and they do not. Rather disappointing. I got excited by the options as I am a side sleeper with spinal stenosis. Went to Amerisleep and Layla. Any suggestions? Hi Teresa – I’d check out Novosbed, Endy, and Casper, all good for side side sleepers and available in Canada. I have chronic lower back pain and lately I have also pain in my left hip (however I sleep on my right side…) my current mattress is a soft mattress one and at this point I wake up every morning with a lot of pain and difficulty to get out of bed. I went for mattress shopping and the foam ones, which are recommended for side sleepers, were really not an option as it was very difficult to change positions or turn from one side to the other since it strained my back enormously and give me more back pain. So I opted for a firm mattress SIMMONS Beautyrest Recharge Platinum Plus Tivoli II Firm Tight Top Set and after sleeping on night on it I feel it is waaayyyy to firm and not sure if it’s the best for me. The reason I picked this mattress is because it was firmer then what I had before and when I was turning from one side to the other it wasn’t straining my back as much. Hi Jenn – I’d go with a foam-feeling hybrid or a high density memory foam mattress. If you and your husband have very different preferences/weights, you could consider a split king as well. Hi Joe, Im trying to decide between the Amerisleep Colonial and Independence. I am a side sleeper, with hip and shoulder pain. Any suggestions? Hi Michelle – too close to call! I think it really varies from person to person based on their weight, body shape, preference, sleeping position, etc. Hi I’m a side sleeper that likes a firm bed with good support to the edge of bed. I hate that sinking feeling of memory foam where you feel sucked into the mattress. My man is a big heavy guy and I’m 125lbs. Please help. I need keep!!! These are all foam mattresses. Are there any 100% latex or hybrid (either latex or foam with innerspring) that you would recommend for side sleepers (125 and 220)? Hi Kris – I’d check out Plushbeds for all-latex and WinkBeds for hybrid. HI Ive been looking for a mattress for the last few weeks and came across a nice spink and edgar mattress at a mattress firm store I really like the concept of a more natural materials comfortable mattress but I can’t find any review on this mattress its the Alpaca 7000 and I want to hear from someone who actually has the mattress? It is on a super sale so if I buy it I can only exchange this mattress so its a bit stressful committing to it. Help! Hi Anika – I haven’t tried that brand unfortunately! I’ve just purchased a Spink & Edgar Alpaca and now I want to turn in early and sleep in late! I was concerned about toxicity of memory foam and other types of materials, chemicals and flame retardants used in most beds. I didn’t find the natural latex as comfortable as I’d hoped. I ran across the Spink & Edgar and was impressed with the company. They grow all the materials for their sustainably on their farm in Yorkshire, England. Most queen beds have 400 coils; the Alpaca has over 7000 coils & mini coils, topped with hemp, flax, cotton, wool, alpaca, and Egyptian cotton. The mattress looks beautiful, is a dream to sleep on, won’t harm our environment or your health. I’m a side sleeper and like a medium firmness. The Alpaca is perfect for me. Yes that’s pretty standard for a King adjustable bed, I’d check with Amerisleep to confirm. I notice in the reviews that for each mattress you mention cost as a factor, but I’m curious if money was no object if a different mattress would make it to the top of your list. I sadly do not have the imaginary infinite bank account to spend, but I wouldn’t mind seriously considering something more expensive if it turns out it could help me with my chronic back pain. Hello, thanks. I’m 5’10, 250 pounds (heavy). This site is awesome. I’m a side sleeper but live abroad so my options are limited. I’m between a tempur (they only have 3 types: original, sensation, and cloud each in a thicker vs less thick version), or a Serta iSeries Vantage Firm Formerly (Applause). I tried both and they feell good. I tend to sleep well in hotel beds. My own bed is firm with a 3inch memory foam pad, and I sleep ok, but tend to sleep better at hotels like westin. In my own bed I turn a lot because my hips start to feel pain. Any advise between the options above? 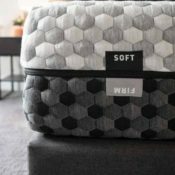 Are any of these listed “very soft”? This site is really helpful! We just purchased a floor model of the tempur-pedic cloud supreme b/c our old tempur-pedic (which was really firm) was too tough on my shoulders .However, this one seems to be even firmer and my shoulders, back, and hips are really hurting after two nights (keep in mind it is a floor model so I am assuming it is pretty broken in). I am super lightweight (115 lb female) and am a side sleeper. Are any of these options good for lightweight folks? Or are any of these options going to be softer than a cloud supreme? Hi Kristy – being that light, finding the right mattress can be tricky (every mattress feels different to different people, weight is a big factor). If you’re feeling like mattresses are too painful, I’d try going very soft and seeing if that is a better fit for you. In past reviews you had said the Lull was a good pick for side sleepers, I was all ready to buy the Lull today until I saw this list. Now it is back to square one. One question buddy, why no mention of the Lull for side sleepers when in the past you said it was good for side sleepers (as well as all other positions)? Thanks for your time and have a great day! I know latex is good for fibro and OA but latex nor foam seem to have edge support and I sleep on side at edge. Did I choose mattress which will end up hurting me if it has individually wrapped coils and plush foam atop? I also have latex topper. Thx again. Hi JC – pocket coils are also great for support as well! And you’re right, will almost always have better edge support than a pure foam mattress. What are your thoughts on Purple? My husband and I are both sleepers who are mostly on our sides or backs and occasionally on our stomachs. I feel like we are all over the place, although maybe we are just tossing and turning. We do both wake up with aches and pains regularly. I also want to avoid anything that will be hot when sleeping. Right now we have a relatively new (< 1 yr) flippable inner coil mattress, with a separate (too firm?) foam topper and a simple wool topper on top of that. I like the wool topper, but I'm frustrated with everything else. Any advice would be appreciated. Thanks! Hi KC – check out my Purple review for my thoughts. I love all the great matress reviews you’re providing but the more I read the more confused I get. I’m a 6’0 tall 200 pound male who sleeps on his side and has lower back issues. The firm single layer memory foam that I have now is horrible for the pressure points at the hips and shoulders but my last soft pillow top gave me bad lower back pain. I was looking at the Amerisleep Liberty but further investigation found it was best for lighter people, not someone 200 pounds. Any recommendations? If you’re 200+, I’d probably go with a slightly firmer option from Amerisleep (if you like that type of feel). Any others you are looking at? Try an intellibed. I am in Utah, don’t know if there is a store in your location. Can any of these mattress by used with adjustable foundations? Thanks Andy, great insight! I will start mentioning that in my reviews. Off the top of my head, I know Endy, Casper, Leesa, Novosbed are available in Canada, though more and more companies are expanding there. Joe, Thanks for the great insight. I am a side sleeper but do not want foam due to 1. they sleep hotter and 2. hard to change position. What innerspring do you recommend? Thanks! Hi, thanks for the tips..I am a side sleeper and currently in the try out phase of the Lull mattress. I wondered if you tried that one? The first week was terrible but goin on 3 weeks now and is better but cant decide what i should do. Thanks for any input you may have on the Lull. Hi Leann – yes I think Lull could work well for a side sleepers, check out my Lull review for my thoughts. What are your thoughts on the Helix mattress Joe? My back is killing me and so is my neck every day. We have a 1.5″ memory foam mattress topper that my wife and I bought which helped a bit on our old mattress. We thought about moving to a sleep number but I didnt like the sinking feeling at the number the recommended. I read that I’m not heavy enough to engage the proper support of the purple as I’m only 155lbs and my wife is 125lbs. So I fear the polymer upper of the mattress would just be uncomfortable based on other reviews. However, I have yet to hear anything negative about the Helix. Hi Eric – check out my Helix review! Mr Auer what is your opinion on beds with water baffles inside the memory foam. Example I Zone or Boyd specialty. Hi Sandy! I haven’t reviewed a bed with water baffles yet, I will let you know when I do! Hi Linda – done! Check out my Casper mattress review. Hi, I am a side sleeper trying to decide between memory foam (like amerisleep) and trying something new like latex (Brooklyn Bedding)… i want to sleep cool and potentially use on an adjustable base. Amerisleep has a combo deal with Legg and Plagget but will run about $3700 with the Indpependance mattress, which was their sugggestion based on my visit to a temperpedic store locally. Do you have a suggestion on which mattress for adjustable base and latex vs. memory foam. (I suppose i have been on a memory foam for so long i am not sure what the “bounce” is supposed to feel like)…. thanks! Hi Joe, excellent site, thanks for all this info. Any recommendations on how to choose between the Amerisleep and the Loom and Leaf mattress? What are the differences? Both seem pretty much the same from your reviews. Amerisleep has more firmness options, so if you really know what you want in regards to firmness, they may be a better choice. Amerisleep offers Celliant on some of its mattresses – personally that wouldn’t sway me, but some people are believers in the technology. Other than that, I’d focus mostly on the feel videos (they are similar, but slightly different) to help make your decision. Hi Joe, I am on my 4th mattress. I am an overweight (220) 56 yr. old female. I can get to sleep but wake up half way through the night with extreme back pain. My fear with a foam mattress is that it won’t be able to support my heaviness and will sag and give me more back pain. Thoughts? Hi Lori – what have you gone through so far, and what did you not like about them? Sorry it has been such a saga for you! I am in the middle of returning my Ghostbed right now. I’m a side sleeper and a stomach sleeper. Unfortunately the Ghostbed was just too firm for me in most cases. Not bad for stomach and back positions (8-9/10), but definitely a no go on the side (I’d give a comfort rating of 6/10 for that). I weigh 150 lbs and am 5’8″. Currently looking at the Leesa, but do you have a better recommendation? Something just a little softer than the Ghostbed? Thanks! If you want softer than Ghostbed, I’d check out Helix, Layla, and Brooklyn Bedding (soft). I’m debating between ghostbed and Tuft and Needle. Tuft and Needle is so far the best priced, and has more 5 star reviews then Bear, Casper, purple, Yogabed. And it’s materials are certified green. And thier flame retardant is suppose to be non toxic. Wondering if you have used thier mattress yet. Hi Rochelle – check out my Tuft & Needle review here. 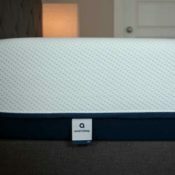 Have you heard of or reviewed the Dromma mattress? It’s a relatively new company that I’m curious about, has 12″ thickness and 12 year warranty which is good. I have…planning to review it soon! What about the Purple mattress? How does that compare? 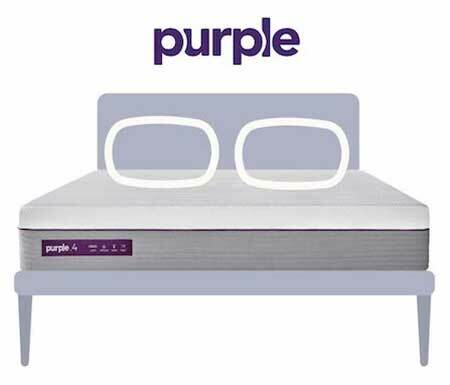 Check out my Purple Mattress Review, great option for side sleepers as well. Hey Joe, can you help me out? Ive been off an on researching a mattress for a couple of months and I think it is the hardest thing in the earth to do. 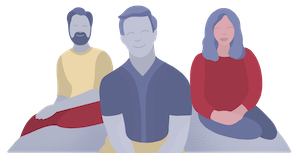 The mattress companies make it ridiculously hard because it seems like most mattresses are their best guesses on how to approach a market segment. Plus their lines change names from one company to another. What a maze. My wife is a side sleeper with osteoporosis, I absolutely must find a quality mattress for her. Her parents have a mattress in their spare room and when we go to visit she sleeps well. She says just find that mattress and itll be good. This is a Sears o pedic but its 15 years old. Of course its soft. Its broken down. Mission: To find a mattress that is medium. I think? Not medium-firm. Hi Dave – I haven’t tested Sears-o-pedic myself, but it looks to be a hybrid. Have you looked at Saatva or WinkBeds? Hi Jenn – I’d think that an especially pressure relieving mattress would be a good option (broad shoulders = more potential pain there if side sleeping). Purple and Layla come to mind off of the top of my head, let me know what you think! Joe, I am buying an adjustable bed frame, king size to accommodate two twin xl size mattresses. I know the brand of adjustable bed I want. I am having difficulty selecting the mattress. My wife’s side should be easy. She is not tall and prefers a firm mattress. I am very heavy (over 300) and want something strong enough to support me at about medium firmness. I was trying to decide between a combo of coil spring and foam. To me it sounds long lasting and more supportive. I cheated with a rep from either Loom & Leaf or Zenhaven, I can’t remember which and she said using their spring bed on an adjustable frame would void the warranty because spring beds are not made to be bent for long periods. Yet on another site tonight I read of a mattress that is both spring and foam perfectly good for an adjustable frame. Do you have any suggestions? You should know we have a new adjustable queen size frame and foam mattress that neither of us like. We are stuck with it so we will move it to another room and get a new split king. I have a question about the Loom and Leaf (the Amerisleep and Layla). I’m considering the Loom and Leaf and if I buy it, I plan to get two (2) Twin XL. I was wondering if the edge support is good enough for those who might cuddle in the middle… same Q for the other 2 companies. Thanks. Of the three, I would say Amerisleep has the best edge support. L&L would be second, and Layla would be third. too hard and I couldn’t wait to get rid of them. I tried Layla and it was great except it actually sagged in the middle. All were returned. I just can’t get a good nights sleep. Im a side sleeper. I went into NYC to try Casper, Helix and Alexander and they were all too hard. I don’t know if I should go with latex, foam or springs. My wife is upset and just wants to go to a store. What do you think about the Purple for someone with a very bad back, hip & shoulder pain and is a side sleeper? I’ve got to find something for relief! Hi Kathy – Purple is definitely a very unique feel, personally I found it to be really great for pressure relief (generally good for side sleepers with hip and shoulder pain). So, I’m currently mattress shopping, I have gotten it down to Loom and Leaf , Purple, and Tuft & Needle. I am a side sleeper, with mild back issues, and though I’m not obese, I am overweight. All the companies offer 100 nights of sleep money back warranty…but I think I’m leaning towards the Tuft and Needle… Do you have any thoughts or feed back on these beds. I felt like your Loom and Leaf review is well done, and it started to tip my scale heavier that way… Also, I’m hearing a lot of these foam mattresses have an industrial for about the first week, did the Loom and Leaf have that as well? Hi Eurshla – typically I don’t recommend Tuft & Needle for side sleepers because it is on the firmer side (typically better for stomach/back sleepers). Purple and L&L (medium) are good picks for side sleepers in general. Not sure what you mean by industrial, can you clarify? Hi Jeff – check out my Tuft & Needle review for my thoughts. I am interested in some additional thoughts for bedding for side sleepers. My husband and I have been searching for a new California King bed (due to his height). We do not like the feel of an all memory foam bed. We are heavier and my husband has back problem so we want a bed with good support. I would also like a bed with good edge support since we will be getting a California King but wish we could have the width of a King and I’ve found that some beds really compress at the edges. While trying out beds in stores, I liked the feel of a Talalay latex bed (especially since we sleep very hot) but I did not like the motion transfer. The other bed that we have liked is Beautyrest Black Mariela Plush (tight top innerspring with foams for comfort layer). I know that Winkbeds or Saatva may be similar to this and I am considering them. Since I liked latex, I’m wondering if an innerspring with latex comfort layer may be a good option. Have you tried any of these that you would recommend, especially for side sleepers? I appreciate any thoughts. Thank you! Hi Stacey – the only one I’ve tested is the Nest Alexander Hybrid Latex (haven’t even published a review, currently trying it out). Definitely a great mattress, worth checking out! Thanks for all the helpful info. How would you compare the Alexander hybrid latex to the Alexander hybrid in terms of support, top softness and contour? what do you think of a Wink Bed?? – I am a side/tummy sleeper with hip/back/neck issues. Generally I really like it, and do think it’s a great option for people that want an innerspring/hybrid that are side sleepers. Make sure to check out my full WinkBeds review. Surprised you didn’t mention an all-latex model. Spindle has an amazing product at an affordable price. I bought a Leesa… although it is a WONDERFUL bed overall, it is just TOO firm for me as I am a side sleeper. I wake up with usually my arm asleep, in pain, or sometimes just neck/back pain. But when I do fall asleep on my back (without tossing in the middle of the night), I wake up super refreshed and ready to go. I’m almost at the end of my 100 night trial with Leesa… and I’ve looked all over different blogs, sites, and review sites. I can’t find a good side sleeper. At the moment with my research, I saved in my shopping cart a Helix (as I personalized it with the softness level 3), I’m still wary about ordering it. It’s just tiresome ordering and having to wait to see if it works. I’ve already started my transaction on returning my Leesa. What would you recommend that is in the same price as Leesa, a great side mattress? I looked at L&L in the past, but looking on reviews, it’s said to have a little more firmness than the Leesa, thus I didn’t order it. Do you think Helix is a good next one to test out? Or should I go with a different one? Thanks for the help in advance! Hi John – sorry Leesa didn’t work out! I would say L&L (the medium) is a touch firmer than Leesa, so probably not a good option for you. Helix could be a somewhat similar feel, but with the right setting will be softer, so I’d say probably a good one for you to try! Thanks a bunch Joe! I’m placing my order for Helix to try today. Keep up the great reviews!!!! Appreciate the kind words John! Hi John! I am in the EXACT same boat with the Leesa as you were, waking up with shoulder pain and my arms asleep. Would you mind sharing your experience so far with the Helix? Any better? I’m starting the return process tomorrow for my Leesa and am not sure what to try next. We have an old (18 years) latex mattress. We were told it was a lifetime mattress. I’ve had back problems for years now, but can’t quite convince my husband that it’s the mattress. I’ve added a thick eggshell, then a feather top. I still toss and turn. So I’ve been searching for a new mattress. Casper seems like it might be too firm. I was leaning toward Helix until I read this. I’m grateful for your work! Thank you for the kind words Jennifer! Generally thick eggshell and feather top will not be good for back pain, so if those are necessary, probably time for a new mattress. 18 years is a very good lifespan! What exactly are you looking for, another latex mattress? I list my favorites here. Hey Sandra – yes prices went absolutely crazy, that’s one of the reasons the online market has really become popular. Most of them are foam (a few spring options in there too), and they do sleep cooler than when memory foam first came out – but they still do sleep warmer than a spring or latex mattress (generally). It’s hard to make a decision, that’s why I have the site! I try to break it down by categories – type, price, sleeping position, etc to try and get you heading in the right direction, but I hear you that it still feels overwhelming, especially at the start of the process. Let me know if you’re looking at any specific brands or have any strong preferences! I have an interest in the Saatva Plush Coil Spring bed. I am a side sleeper, about 280lbs. I love the Simmons Black Hybrid soft, but its totally out of my price bracket. What do you think about the Saatva, does it compare to the BLACK? I think the Saatva is a great lower-cost option to the Simmons Beautyrest Black series. Nice blog, Great to know how to sleep well. otherwise it can lead to shoulder pain or back pain. very informative. I have scoliosis and three compressed lumber vertebrae and my chiropractor said I should get a firm mattress. But, I am concerned a firm will be too hard and create pain. I am currently sleeping on an air mattress with a foam top and do wake up in some pain. I tried Sam’s mattresses but they sink in the middle after a while. There, I am able to return the mattress though. I am fearful of buying a mattress in a store because of their no return policy. Can you recommend a mattress for my particular condition? Also, if the mattress doesn’t work for me, what is your process for a return? Ex: How would I be able to roll up the mattress into the box and is there a shipping fee? Hi Nancy – most of the online-only companies have a trial period (ranging from 75-125 days). You can return the mattress for a full refund within this time, some will charge shipping but most will not. If you are interested in a foam mattress, I would look at this page (side sleepers), my memory foam recommendations, or my latex recommendations. I didn’t realize that the wrong mattress could cause pain for your shoulders and hips. 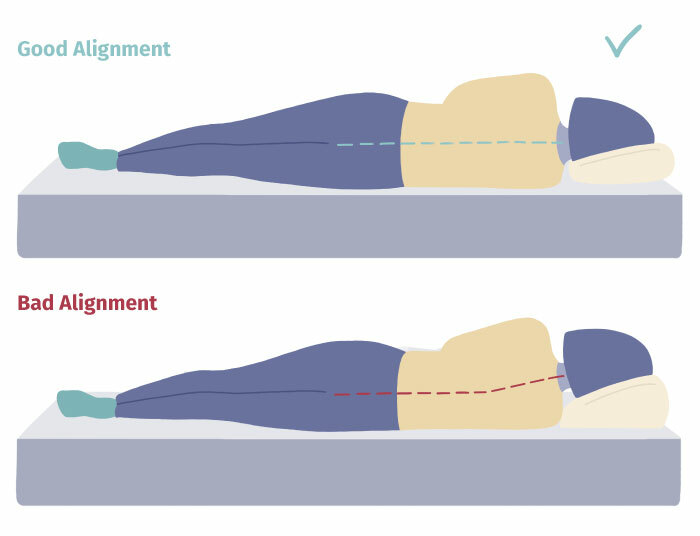 It seems like it is really important to make sure you are sleeping on the correct mattress so your spine can stay in alignment. Is purchasing a new mattress something that I could speak to a physician about to make sure I am purchasing the right material? Marie – in my personal experience the physicians haven’t been much help (just a few basic tips, like a pillow between the legs if you’re on your side, etc). But naturally expertise and familiarity will vary by each physician. The important thing that you mentioned is that a mattress can have a dramatic impact on hip and shoulder pain! Many people have this pain, but look to other parts of their life/day before sleep. How you sleep and the quality of your mattress can have a dramatic impact (both positive and negative) on pain throughout the day.